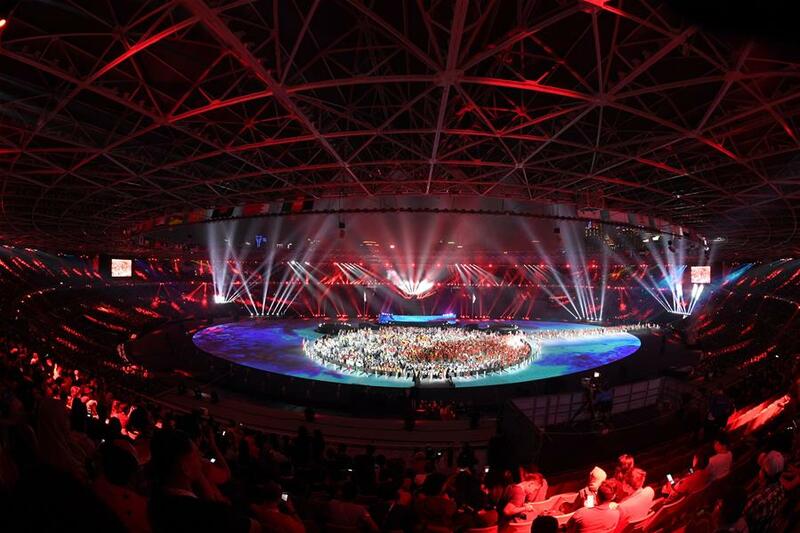 JAKARTA, Sept. 2 (Xinhua) -- The 18th Asian Games drew to a successful end with a stellar closing ceremony here on Sunday as Asian sports power China again dominated medal table of the multi-sport event. China once again called the shots leading with 132 gold, 92 silver and 65 bronze medals, although the Asian giant sent a relatively young delegation, with 631 out of their 845-athlete squad have participated in neither the Olympics nor the Asian Games. "The Asian Games can serve as a mid-term exam for us in build-up to the Tokyo Olympics," Chinese delegation general secretary Liu Guoyong said during the Games. "The Games could let them have a feel for major international sporting events." Japan Sunday won the mixed triathlon gold in the last event of the two-week, 40-sport Games, ahead of the closing ceremony held in the Gelora Bung Karno Main Stadium. Japan achieved better-than-expected results at the Asiad as they wrapped up the campaign with a total of 205 medals, including 75 golds, 56 silvers, and 74 bronzes, overtaking South Korea to finish second in the tally for the first time in a decade. South Korea totalled 49 golds, including men's football gold medal. The Big Three were followed in the gold-medal ranking order by: Indonesia (31), Uzbekistan (21), Iran (20) and Chinese Taipei (17). India and Kazakhstan each had 15 followed by the Democratic People's Republic of Korea (DPR Korea) and Bahrain with 12. DPR Korea and South Korea formed a unified team to participate in three sports of the Games and won four medals overall, including a historic gold in dragon boat racing, which was the first gold medal by a unified Korean team at a major multi-sport event. Six months ago, A unified women's hockey Korean team played at the PyeongChang Winter Olympics, but they failed to earn a medal. The Asian Games have been a great athletic success, witnessing six world records highlighted by Chinese swimmer Liu Xiang's stunning performance in the women's 50m backstroke. Liu's time of 26.98 seconds made her the first woman breaking into the 27-second mark in the event. A total of 18 Asian records have also been set up at these Games. A flag handover ceremony was held amid the closing ceremony as Xu Liyi, mayor of east China's Hangzhou, was handed the Olympic Council of Asia (OCA) flag, marking the Asian Games enter into "Hangzhou Time". Hangzhou, set to hold the next Asian Games in 2022, is the third Chinese host of the continent's showpiece event after Beijing in 1990 and Guangzhou in 2010. The Hangzhou Asian Games Organising Committee (HAGOC) has promised an event of the "highest possible standards" and sent a delegation of nearly 260 people to Jakarta for learning and observation purposes. "We assure you it will meet the highest possible standards in staging a special edition of the Asian Games with Chinese grandeur, Asian style and a Hangzhou flavor," said Xu Jianfeng, deputy director of international relations of HAGOC, at the 37th OCA General Assembly held in Jakarta. Jakarta has had less than the normal amount of time to prepare for the Games. It was selected only four years ago after Vietnam, the original host, pulled out due to financial setbacks. This allowed for only four years of preparation, instead of the usual six to seven years. Although Jakarta had to organize the event in a short time, on a tight budget, the capital city has proved that it can host a multi-sport international event involving 45 countries and regions. It's the second time for Jakarta to host the Asiad, which had its fourth edition in the Indonesian capital in 1962. What are US’ intentions behind its initiating trade war?